I've said before that I hardly ever make my own fish dipping sauces. After all, even though we split it up, my brother and I still haven't made much headway into the 56-oz jar of fish sauce that my mom brought down last year. Nuoc Mam (Vietnamese Fish Sauce) is a vital part of most Vietnamese dishes. Most Vietnamese just say nuoc mam to refer to all fish dipping sauces, but there are distinctions. There aren't hard and fasts rules, as it depends on your personal preference, so I'm grouping both of these fish dipping sauces together in case you prefer one or the other. In general, I use nuoc mam cham ngot (Vietnamese sweetened fish dipping sauce) for pouring on dumplings, savory crepes, and noodles. 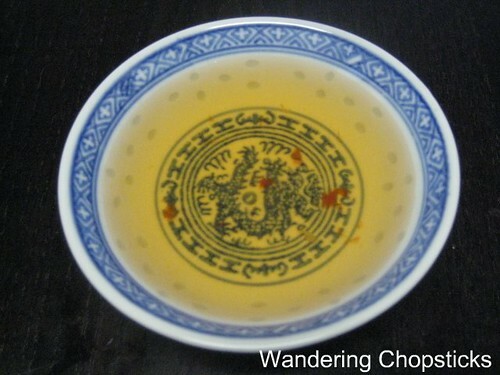 The sweetened fish dipping sauce, tends to be diluted with water and just has fish sauce, sugar, and vinegar. Nuoc mam cham (Vietnamese fish dipping sauce), is slightly more pungent with garlic and chili peppers, and is used for dipping vegetables or rice paper rolls or as a dressing for salads. It's easy enough to make a big jar and store it in the refrigerator. I tend to use vinegar so the fish sauce won't spoil. Then if you wish, just squeeze in fresh lime juice before serving to brighten it up. Boil 1/2 cup water. Actually, you don't have to boil the water, just get it hot so that it can dissolve the sugar more easily. Stir in 1/2 cup vinegar, 1/2 cup fish sauce, and 1/2 cup sugar. Taste and adjust if necessary. Add crushed chili peppers if you wish. The taste should be slightly sweet and rather mild, the pungency of the fish sauce quite muted. Store in a jar in the fridge. Serve with dumplings. In you're feeling the need for more of a kick, then make the saltier version of nuoc mam cham, which omits the water and adds garlic and chili peppers. I usually make this version in small batches with fresh garlic and chili peppers when I want to dip or to toss with salads. 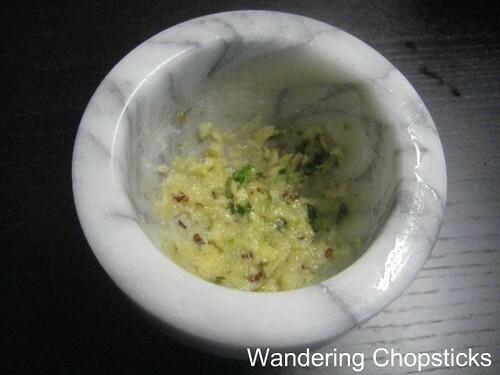 While you can certainly mince the garlic and chili pepper, I think the flavors come out better by slowly grinding in a mortar and pestle. Add 2 cloves garlic, 1 chili pepper, and 2 tblsp sugar. 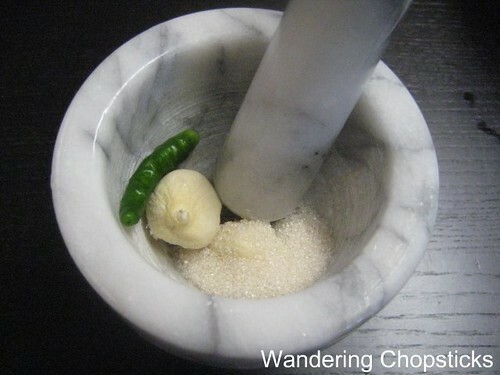 Add the sugar last so that it keeps the garlic and chili pepper from bouncing out of the mortar. Grind the mixture until you get a relatively smooth paste. Then scrape the mixture into a bowl, add 1/4 cup fish sauce and the juice of 1 or 2 limes. Taste. Adjust if necessary. If it's too pungent, dilute with water. Use as a dip or as a dressing for salads. 1 year ago today, Kimchee Pajeon (Korean Pickled Napa Cabbage Pancake). Hmm, I never thought about using vinegar instead of lime to keep it from spoiling- I tend to make just enough for that meal and then I toss the rest. I don't like the smell of vinegar- ewww. That's a good idea though- to squeeze some lime in right before serving. Thanks WC! I've heard other people say they hate the taste of vinegar in their nuoc mam, but I love it so I've no problems at all. Plus, it's just more practical to make a big batch since I don't always have lime on hand. I made this sauce once but just guessed the ingredients according to how it tasted to me. I'm glad to see that I was pretty much right on! Thanks! What is the difference between the two sauces you put up? Well I've tried making the one with vinegar but it doesn't taste like the one they make at my local Vietnamese restaurant. I try to make it and let it sit for a few days so the strong taste of vinegar won't be so strong but it doesnt help. So I gave up on trying. So what do you think? Any suggestion on how I should do it? I think I say what the differences are pretty obviously in the descriptions and recipes. "In general, I use nuoc mam cham ngot (Vietnamese sweetened fish dipping sauce) for pouring on dumplings, savory crepes, and noodles. 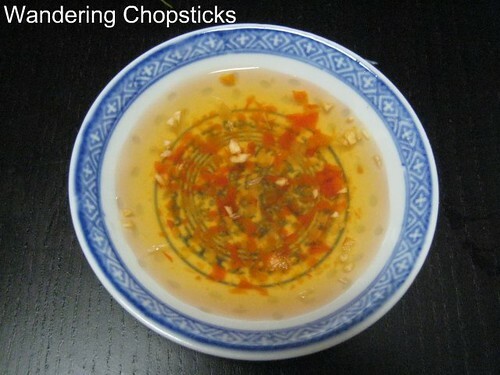 The sweetened fish dipping sauce, tends to be diluted with water and just has fish sauce, sugar, and vinegar. Nuoc mam cham (Vietnamese fish dipping sauce), is slightly more pungent with garlic and chili peppers, and is used for dipping vegetables or rice paper rolls or as a dressing for salads." If you don't like the taste of vinegar, then use less. Don't stick with the proportions, those are only a guideline, adjust to your taste. Also, adjust the type of vinegar you're using and see if that makes a difference. I also suggested if you don't want to use vinegar to use lime juice, did you try that? Every one... make this. Its simple and right on the money. I have not tried the added chili/garlic/lime/sugar version but that is next! Thanks for sharing the knowledge. I use 3 Crab brand fish sauce to make my dipping sauce and Squid brand to cook with. Makes a big difference in taste. Do you use rice vinegar or white vinegar? I generally prefer to use rice vinegar for dipping since I like the flavor more than regular white vinegar, but you can use any type of vinegar that you like. 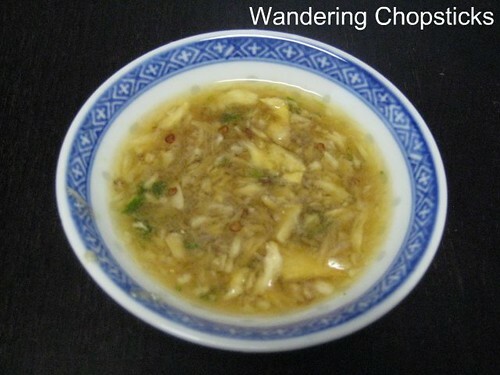 For children, I make the sweetened fish dipping sauce without chili peppers. But otherwise, use any chili pepper you wish. I either go with fresh Thai bird's eye chilies or a spoonful of Huy Fong chili garlic sauce.